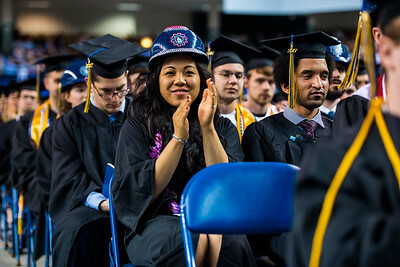 Civil engineering student Jenah Laurio applauds UA Board of Regent member Karen Purdue following her speech at Commencement 2017. 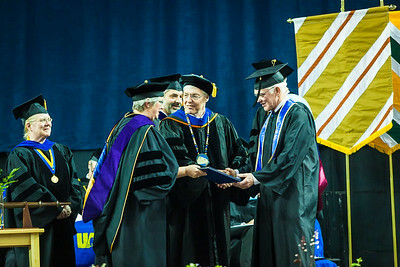 Greg Owens, associate professor of mathematics and developmental education, emeritus, shakes hands with Vice Chancellor of Rural Community and Native Education Evon Peters at UAF's Commencement 2017. 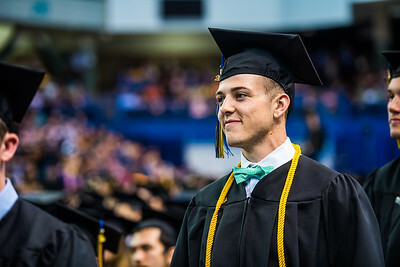 Mechanical engineer and former member of the rifle team Tim Sherry waits in line to receive his diploma during Commencement 2017. 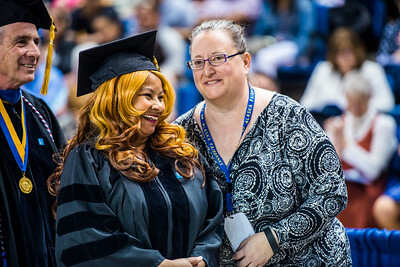 Doctorate recipient Linda Nicholas Figueroa smiles before posing for a photo during Commencement 2017. 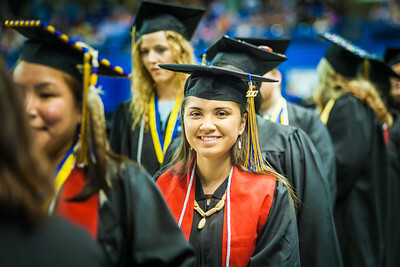 Shirley Morin poses for a picture during Commencement 2017. 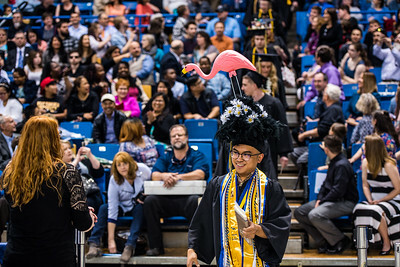 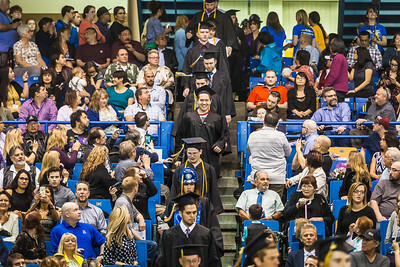 UAF film graduate Ryan Osborne walks back to his seat after receiving his diploma during Commencement 2017. 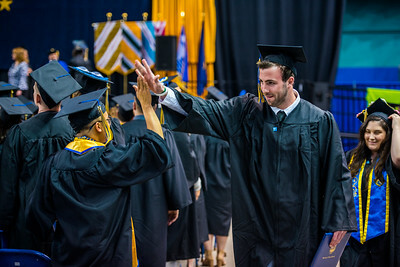 UAF film graduate Mark Stoller high-fives Daniel Nero after both Nero and Stoller received their diplomas at Commencement 2017. 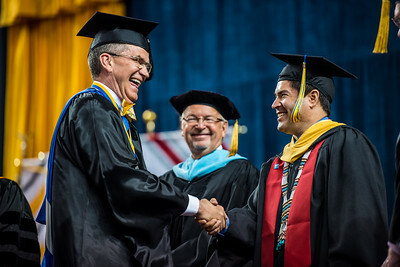 Arinesha Smith shakes hands with interim Vice Chancellor for Student Affairs and Director of Athletics Gary Gray. 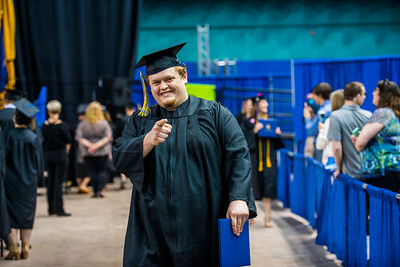 Journalism student Aaron Walling poses for a picture during Commencement 2017. 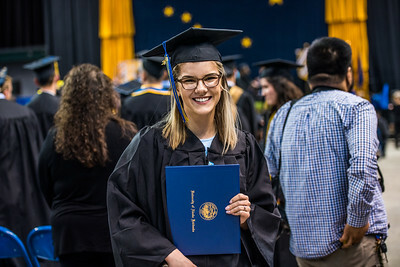 Economics graduate and former Nanook swimmer Noelle Graham poses for a picture during Commencement 2017. 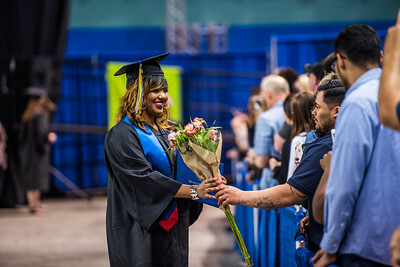 CTC student Tressica Chambers receives flowers after walking across the stage during Commencement 2017. 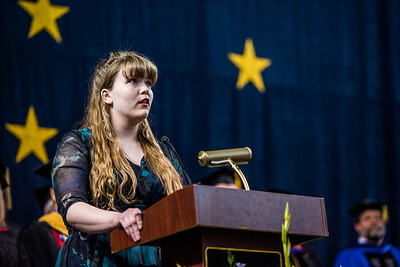 UAF performance major Casey Winkleman sings the Alaska Flag Song following the presentation of degrees and the student speaker at Commencement 2017. 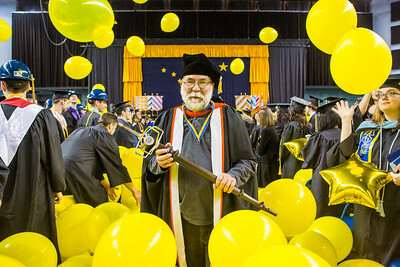 UAF interim Chancellor Dana Thomas grabs a balloon following Commencement 2017. 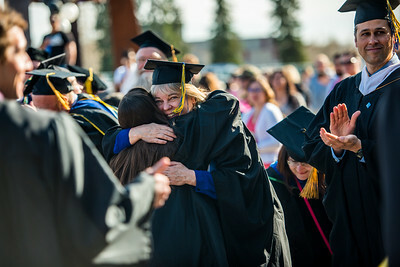 UAF Spanish instructor Kim Aragon-Stewart hugs a student following Commencement 2017. 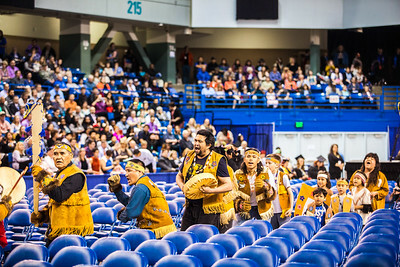 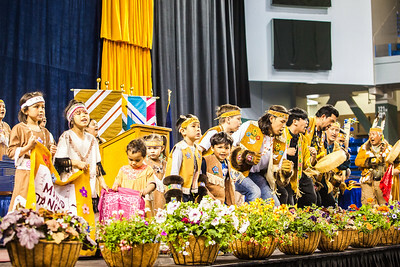 The Minto Dancers led the 2017 commencement ceremony's processional Saturday, May 6, at the Carlson Center. 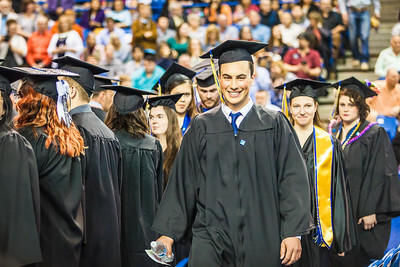 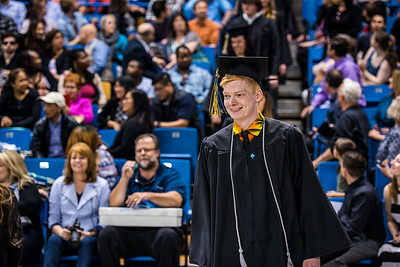 Ben Kirchenschlager is all smiles during the 2017 commencement ceremony processional Saturday, May 6, at the Carlson Center. 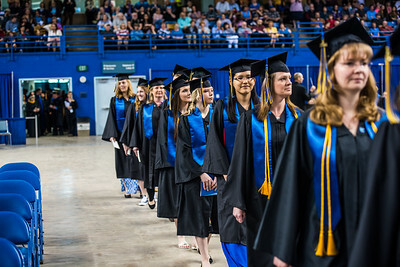 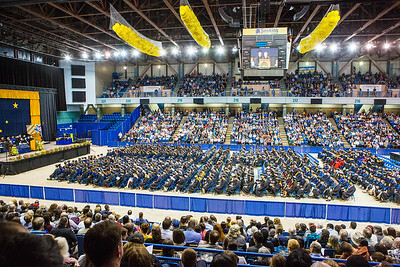 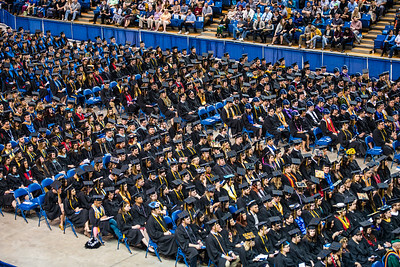 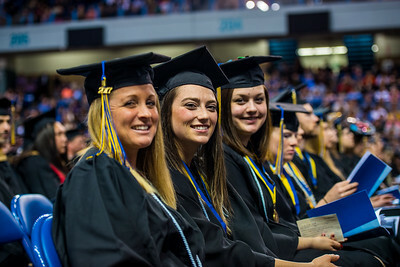 Graduates process down to the main floor of the Carlson Center during the 2017 commencement ceremony. 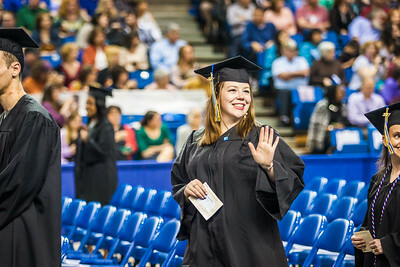 Graduate Anastasia Brease waves to the audience during the 2017 commencement ceremony processional at the Carlson Center Saturday, May 6. 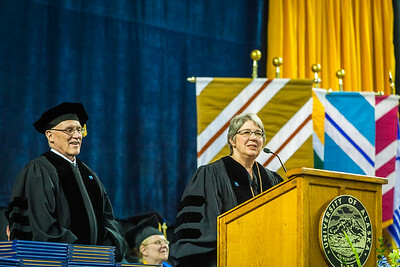 Karen Purdue and Charles Bettisworth provide remarks during the 2017 commencement address at the Carlson Center. 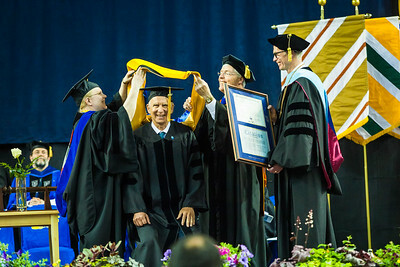 Charles Bettisworth receives an honorary doctor of laws degree at the commencement ceremony May 6, 2017, at the Carlson Center. 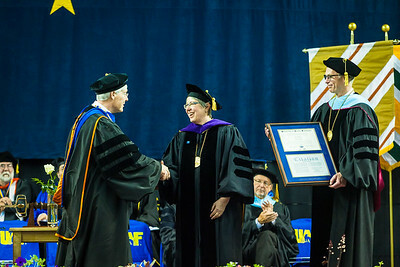 Karen Perdue receives an honorary doctor of laws degree at the commencement ceremony May 6, 2017, at the Carlson Center. 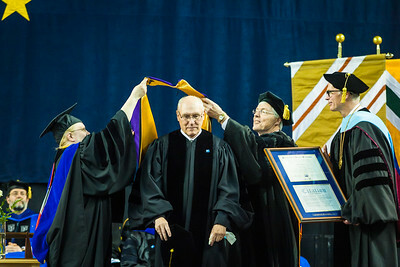 Torre Jorgenson receives an honorary doctor of science degree at the commencement ceremony May 6, 2017, at the Carlson Center. 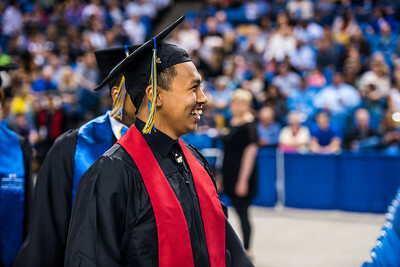 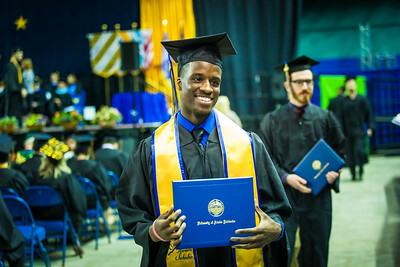 Farimang Touray Jr. is all smiles as he poses for his family's cameras during the 2017 commencement ceremony at the Carlson Center Saturday, May 6. 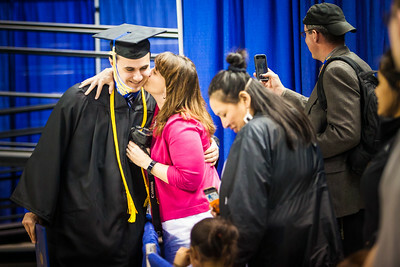 Kelly Goeden congratulates her son, Zach, after walking across the stage during the 2017 commencement ceremony at the Carlson Center. 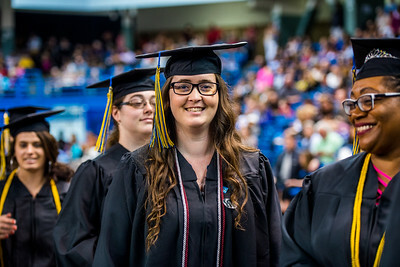 Chelsey Zibell is all smiles as she stands in line before walking across the main stage at the 2017 commencement ceremony at the Carlson Center. 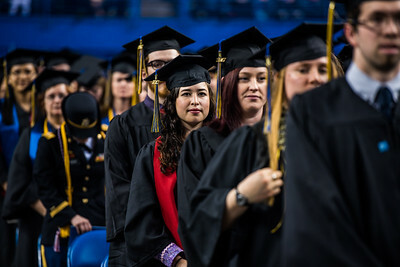 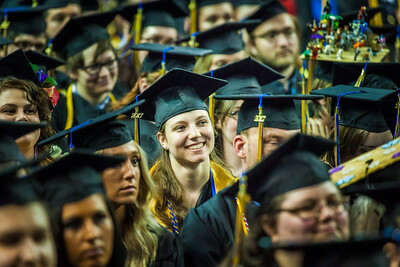 Megan Lasselle listens to class speaker Daniel Nero during the 2017 commencement ceremony at the Carlson Center, May 6. 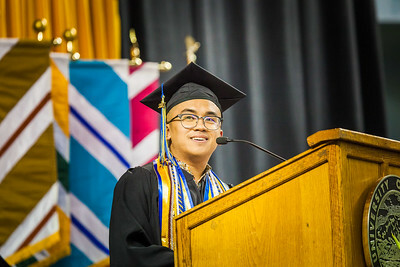 Commencement 2017 class speaker Daniel Nero acknowledges and recognizes his mother and all the mothers present at the Carlson Center during his speech. 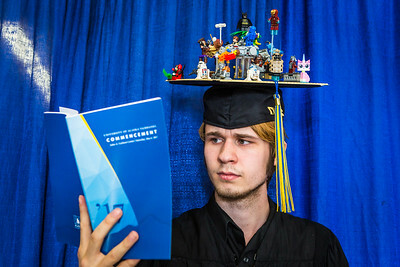 Wearing an ornate cap made with miniature Lego figurines, Ryan Osborne poses for a photograph before the start of the 2017 commencement ceremony, Saturday, May 6, at the Carlson Center. 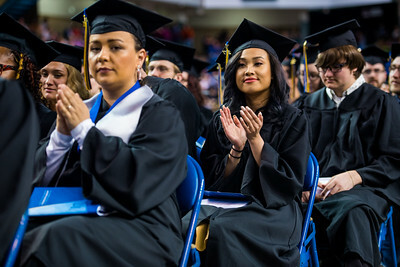 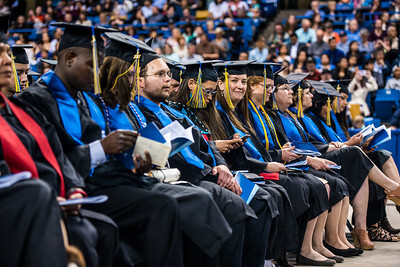 On the year of the unversity's 100th anniversary, students crossed the stage to receive a certificate or degree during the 95th comnencement ceremony Saturday, May 6, 2017, at the Carlson Center. 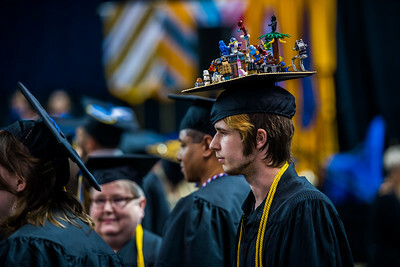 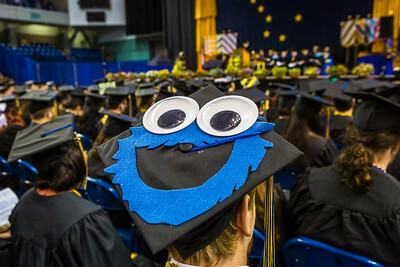 Max McKernan's cap is creatively decorated during the 2017 commencement ceremony. 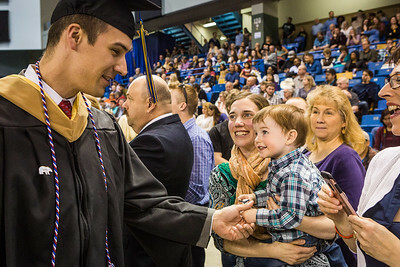 Master of Business Administration graduate Phil Hokenson greets wife Laura, bachelor of arts graduate in social work, and their 2-year-old son, Max, at the 2017 commencement ceremony. 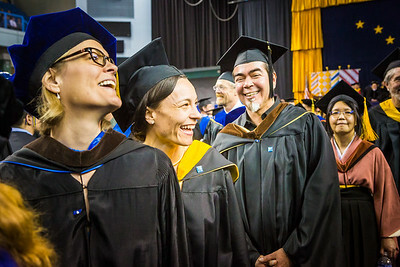 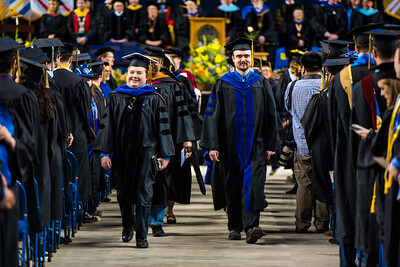 Members of the UAF faculty greet and congratulate students as they process down the aisle flanked by the Class of 2017 during the commencement ceremony Saturday, May 6, at the Carlson Center. Grand marshal James Begét caries the university mace as he leads the recessional during the 2017 commencement ceremony Saturday, May 6, 2017 at the Carlson Center. 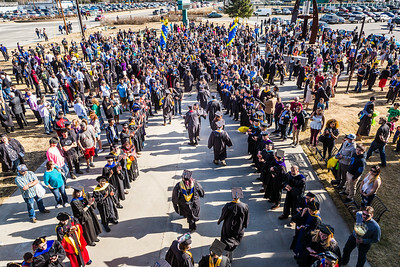 Forming two lines outside the Carlson Center, faculty greet and congratulate graduates after the Commencement 2017 ceremony. 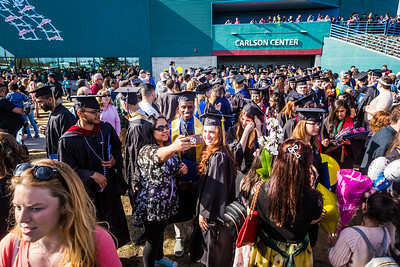 Graduates with their friends and family gather outside the Carlson Center after the 2017 commencement ceremony Saturday, May 6.